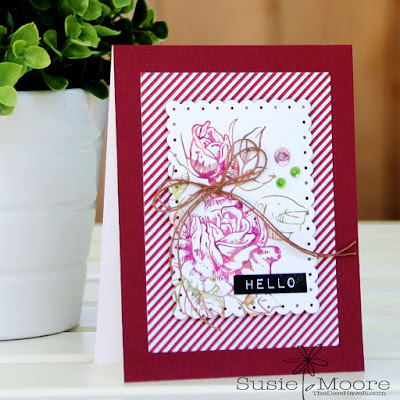 Did you notice the stamp set that I used yesterday? I was away from home and I couldn't remember the stamp name or the company website when I published my post. So I used it again today so I could tell you about this stamp. It is called Rose 1 and it is made by a company I discovered at the Great American Scrapbook Convention last month. Local King Rubber Stamp has a very interesting product line. They carry red rubber stamps that can be colored with their brand of water based markers. The difference in their product is that you just scribble all over the stamp with as many colors as you want. I mean scribble like a preschooler. It is weird. But it makes for some gorgeous stamped images. I hope you will check them out. I plan to play more with their markers and see if they work on other stamps. I am thinking they will! See you tomorrow and have a wonderful today.